Martin VanTrieste, former chief quality officer for drugmaker Amgen, was named the health system-led generic-drug company's CEO, the organizations announced Thursday. VanTrieste, who has more than 35 years of experience in the pharmaceutical industry, is tasked with leading a company that seeks to stabilize the supply of generic medications like sterile injectibles that hospitals rely on and ultimately lowering their cost. The Utah-based not-for-profit generic-drug company, Civica Rx, will include executives from Catholic Health Initiatives, HCA Healthcare, Intermountain Healthcare, Mayo Clinic, Providence St. Joseph Health, SSM Health and Trinity Health, which collectively represent about 500 hospitals. They will provide much of the initial funding for the company, executives said. More than 120 healthcare organizations have pledged their support. Civica Rx's creation was spearheaded by Intermountain, Ascension, SSM and Trinity, reflecting their growing frustration with healthcare's status quo. The company, which will be an Food and Drug Administration-approved drugmaker that either directly manufactures generic drugs or sub-contracts manufacturing, also plans to work with the Veterans Affairs Department. It will initially focus on an unspecified group of 14 hospital-administered generics, some of which will hit the market in 2019. Also, the consortium expects to sell consumers generic drugs that it produces cheaper than incumbent generic-drug makers, the group said. "We are creating a public asset with a mission to ensure that essential generic medications are accessible and affordable," VanTrieste, who will not take a salary, said in statement. "The fact that a third of the country's hospitals have either expressed interest or committed to participate with Civica Rx shows a great need for this initiative. This will improve the situation for patients by bringing much needed competition to the generic-drug market." The Laura and John Arnold Foundation, the Peterson Center on Healthcare, and the Gary and Mary West Foundation will help guide the coalition's not-for-profit mission. "The generic-drug marketplace is broken and, in response, we have created a unique and innovative fix—a public utility that is governed, exclusively, for the good of the people it serves," Dr. Richard Gilfillan, CEO of Trinity Health, said in a statement. "Civica Rx will not earn profits for its investors, but will, instead, ensure that patients receive the greatest benefit—access to the drugs they need at affordable price points." 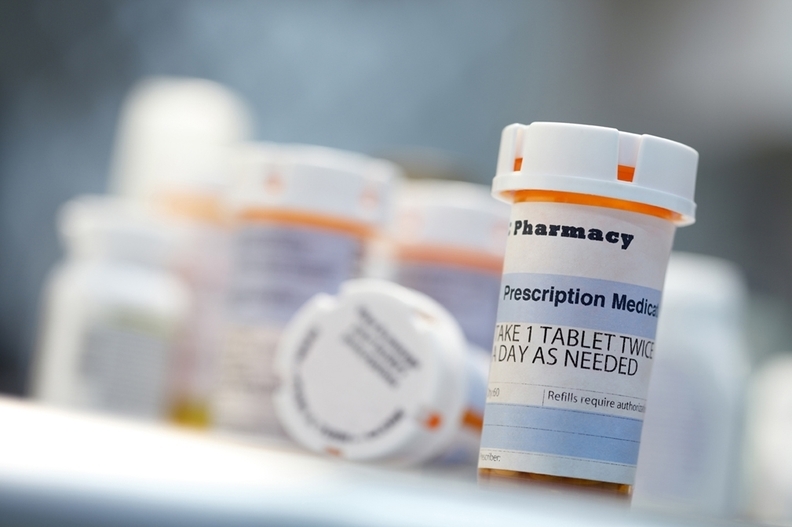 The effort to stabilize a fragile pharmaceutical supply chain, produce cheaper generic drugs and counter pharmaceutical companies that significantly raise the prices of widely used medications has largely been well received. Eighty percent of nearly 750 providers, payers and pharmaceutical companies polled said they are optimistic or cautiously hopeful that the new endeavor will change the status quo, according to a Reaction Data survey. Ninety percent of 605 hospitals and clinics surveyed said they would buy drugs from the new entity. Although branded pharmaceuticals are the primary driver of drug spending, providers and regulators aim to slow ballooning drug prices by introducing more generic drugs. Meanwhile, hospitals, physician groups and health systems have had to substitute certain medications as prices have skyrocketed or as they work around dozens of chronic shortages, sometimes compromising care. Some of the shortages can be traced to manufacturing malfunctions or low margins, which is why the generic-drug company effort has drawn skepticism. Civica Rx will try to prevent manipulations of generic-drug prices, such as when Valeant Pharmaceuticals bought the rights to the heart drugs nitroprusside and isoproterenol and raised their respective prices 30-fold and 70-fold over a three-year span. The main focus though seems to be on hospital-based drugs prone to shortage, though. 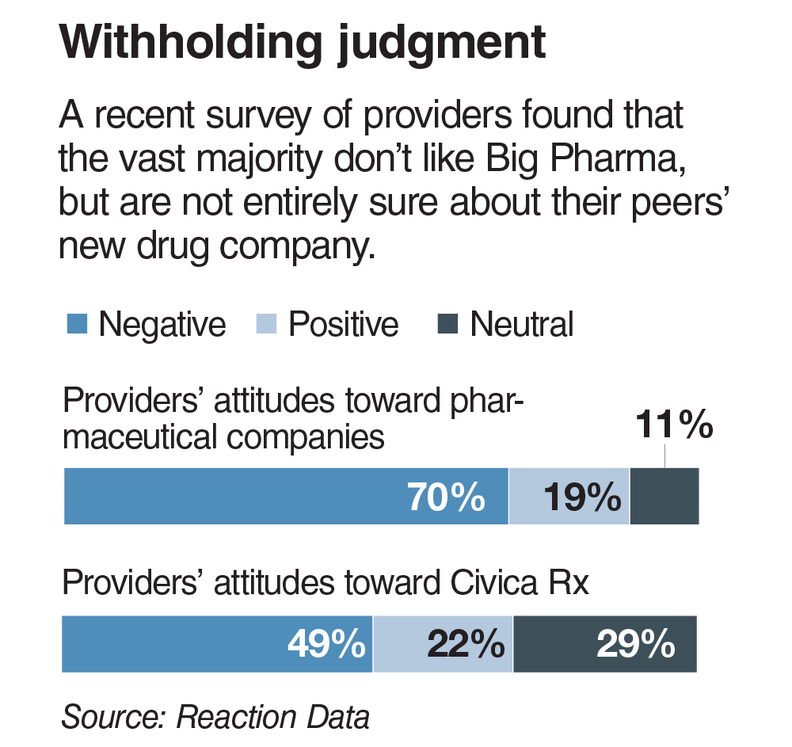 Sixteen percent of pharmacists polled by Reaction Data said the venture threatens pharmaceutical companies while only 10% of pharmaceutical companies concurred. It could be the start of a trend, according to 77% of providers that said the new drug company could be replicated.